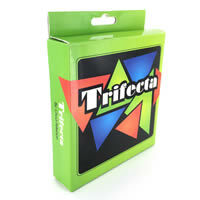 Think quick in this card game called Trifecta as you try to combine three things that you think go together. You'll be combining three random adjectives together by thinking of one idea or thing that can be described by all three adjectives. You'll need to be quick and get creative to outwit your opponents. Trifecta is great to take with your since it is so small, easy to learn how to play, doesn't take a long time to play and is a lot of fun for up to four people. Trifecta is a perfect mentally stimulating game where everyone is sure to have a good time. Give Trifecta a try today. This game comes with 54 cards and the official Trifecta game rules and instructions. Please keep in mind that the official Trifecta dice-card rules and instructions could be different depending on the game version you have. The rules below are some of the exact directions on how to play Trifecta. Share with us your comments, funny stories, tips, advice, strategies, creative ways to play, questions about how to play, problems with the rules or anything you want about Trifecta. All submissions will be reviewed within 24 hours. Click here to add your Trifecta comments.